Floor plans are intrinsically linked to how we live. A bad floor plan makes living a dreadful chore, while a good floor plan celebrates and facilitates a life well lived. Open floor plans are both beloved and loathed, depending on how you want to live your life, and how you like to relate to your house mates and guests. Here, I contemplate the navigation of these choices. Open floor plans — refreshingly flowing or a fresh kind of hell? I’ve mostly lived in smaller, older, more traditional spaces. Closed off kitchens made me sad. I felt like freaking Cinderella as my mate lounged in front of the TV in the living room while I, the scullery maid, slaved over a hot stove and scrubbed nasty dirty dishes. 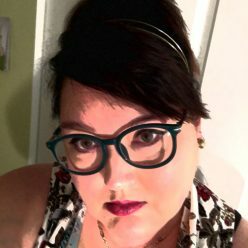 It offended me as a feminist, a mate, and a human being. I tried to put a positive spin on it with frankly sincere folk music or witty talk on public radio. I mean, there is something ancient and GROUNDED about a kitchen, right? It’s where meals have been crafted by loving hands in earthenware vessels with hand-carved wooden spoons and fire-forged knives since the dawn of civilization in the Fertile Crescent, right? Shouldn’t I feel honored to be part of the meaningful tradition? Probably. Yet, I resented the hell out of my Cinderella status. An open floor plan changed my life for the better. Moving to a townhouse with an open family room, kitchen, and dining room served to nullify my scullery maid resentments. The kitchen sink overlooks the family room, and I am never excluded from the fun. I no longer feel like the ostracized ugly step-sister. The fact that my stellar domestic companion does his share of cooking and dirty dishes indeed helps (and nothing is sexier than a man who cooks) but it is the floor plan that has rescued both of us from the loneliness of kitchen DRUDGERY. An open floor plan benefits us, DEFINITELY. An open floor plan with iconic furniture pieces marries the old and new beautifully. Photo by Mina Brinkey – Image courtesy of Houzz.com. Frank Lloyd Wright was one of several early twentieth-century architects who opened kitchens to the other public spaces. This integrated women into goings-on beyond the kitchen as they prepared meals. Certainly this changed the lifestyles of women and the way they could entertain. Apparently I did not invent the isolated-in-the-kitchen problem. History did. Thanks for rethinking it for us, Frank et al. An open floor plan benefits the multitudes, without question. Big or small, open floor plans and great rooms make for a pleasant, flowy kind of life unless you really REALLY prefer privacy. This small, open floor plan is a cozy space with a refreshing palette, ensuring that the coziness doesn’t feel confining. 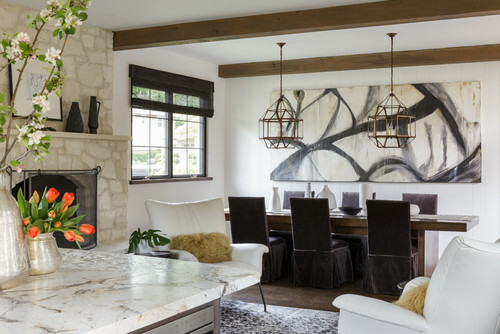 Photo by Mandeville Canyon Designs – Image courtesy of Houzz.com. 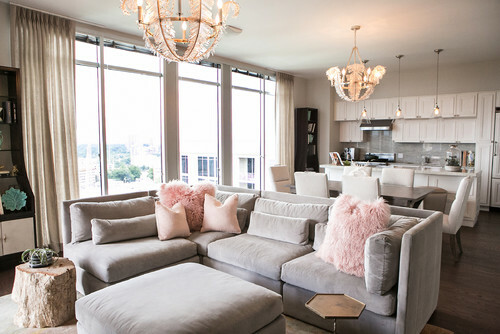 Soft, feminine, boudoir details translate beautifully into this open living space. Begs for a book and wine gathering, in my opinion. Photo by Kat Nelson Designs – Image courtesy of Houzz.com. A shrewd floor plan for an amazing amount of living and storage in a small space. 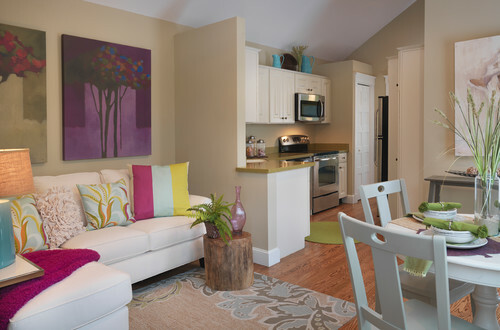 Photo by KSID Studio, LLC – Image courtesy of Houzz.com. Unusual open floor plans creates a sitting space between the kitchen area and the dining area. 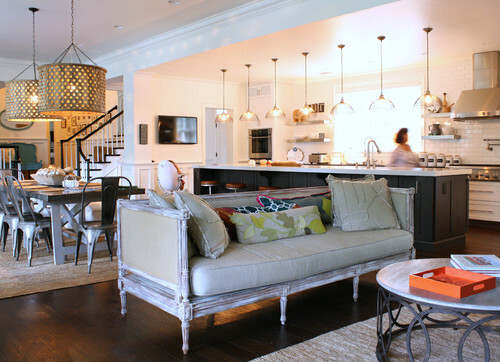 Photo by Ania Omski-Talwar (formerly Orange Interiors) – Image courtesy of Houzz.com. The right open floor plan and inspired decor can liberate a condo from its sadness. Photo by LUX Design – Image courtesy of Houzz.com. Great furniture and accessories elevate this great room beyond its rustic bones. 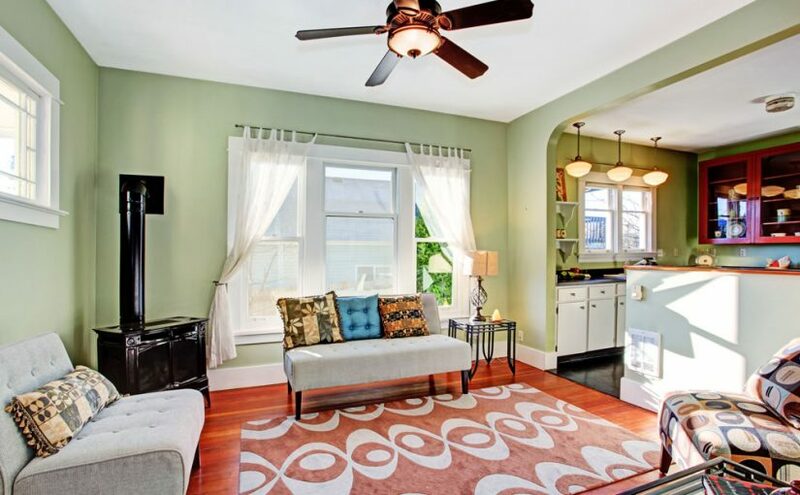 Photo by Soucie Horner, Ltd. – Image courtesy of Houzz.com. Architectural details punctuate this smaller great room with defining style. A quiet aquatic palette allows the architecture to shine. 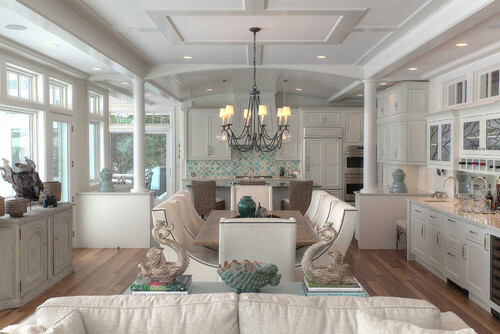 Photo by Kitchen Choreography – Image courtesy of Houzz.com. I agree with Eddie Ross: Think twice about an open floor plan. It might not work for you. But then again, it could be just the ticket — an open floor plan benefits many. 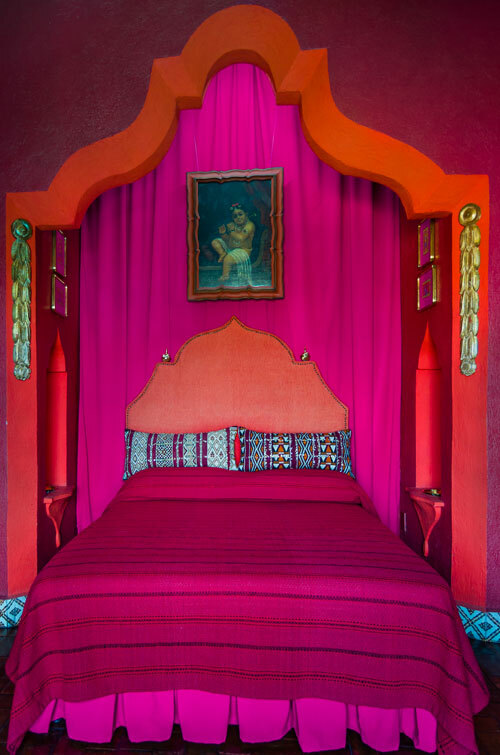 Sleeping nooks rather than guest rooms — an intriguing option. We have other choices besides open spaces vs. closed spaces. In The Not So Big House, Sarah Susanka and Kira Obolensky propose a different paradigm for space planning. Rather than than creating dedicated rooms for every possible activity, they suggest bump-outs. I envision an open floor plan with nooks of all kinds: office nooks, library nooks, piano nooks, sleeping nooks for guests… you get the idea. Susanka and Obolensky also radiate ideas for defining spaces within an open space. Open, yet intimate. Nice option. An open floor plan benefits multitudes of people, but these options can make it ever more livable. How do you relate to space? Glass igloo for viewing the night sky from the comfort of your bed. Philosopher John O’Donahue tells us of the innate Celtic understanding that the human heart longs for open spaces, but it also longs for the psychological safety (and dare I say “coziness”) of enclosure. 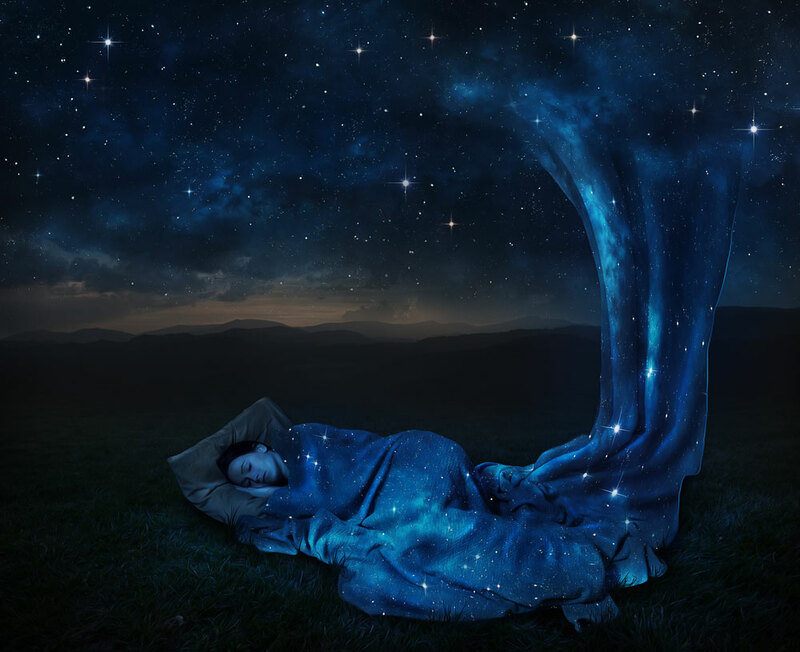 I read about a couple who loved camping, so they built a tiny house in which their bedroom was the roof of the home, under the stars and completely exposed to the elements. That is indeed an open space. 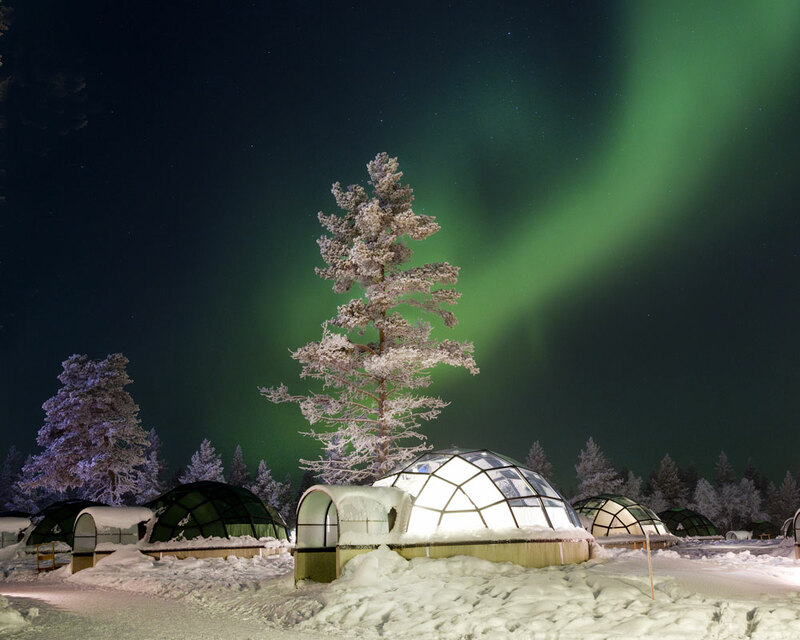 I long to spend a night in a glass igloo in Finland, gazing up at the Northern Lights. Maybe not every night though. In contrast, my friend Jackie in college loved minuscule rooms, with mirrors and paintings from floor to ceiling, like a monk’s cell gone astray, veering into the wayward and decadent. We all must decide for ourselves whether we want to embrace the extremes, or strike a balance between the two. 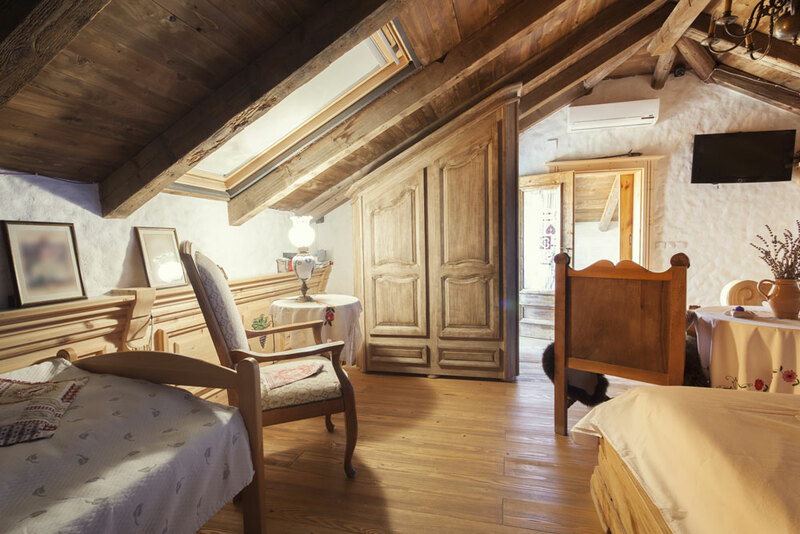 A sheltered attic bedroom is my ideal peaceful place. As for me, although I like an open living area, I have always felt safe and blissfully secure sleeping in a smallish attic bedroom beneath a sloping roof line. If moonlight streams in the window, casting shadows of tree limbs and leaves on a hardwood floor, all the better. I now live in a home where there are enclosed rooms when I crave quiet and solitude, and open spaces for communal time. This is just right for me. Your sense of space, and how you relate to it, will unveil your ideal dwelling scenario.